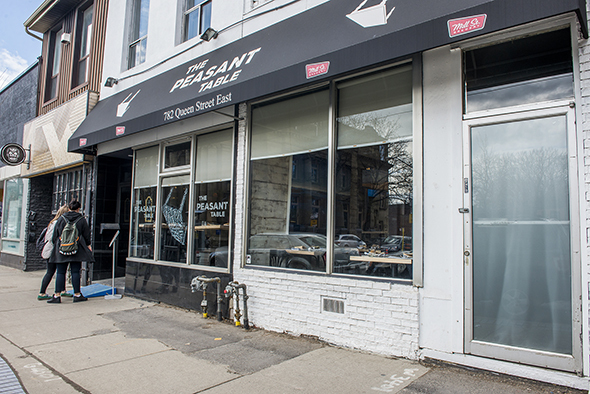 The Peasant Table offers updated, modernized versions of hearty, homestyle Italian fare with German and Eastern European influences. 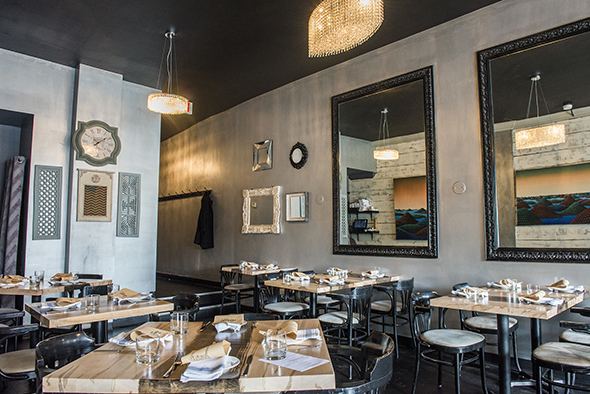 Formerly Table 17 , the Riverside restaurant consists of a rustic-chic bar area, a mirror-filled inner dining room, a back patio and private dining upstairs with its own small kitchen, bar and bathrooms. 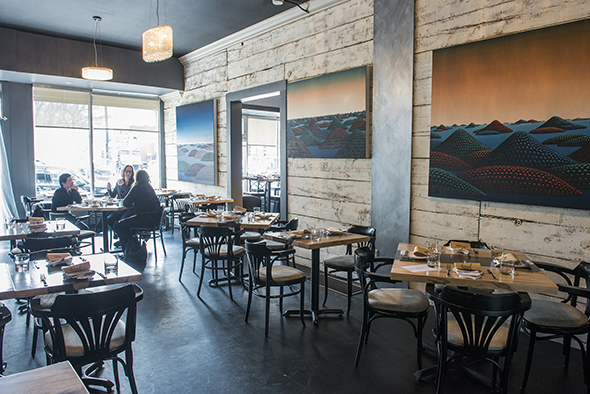 Owner Boris Babic, originally from Serbia, has worked as a chef and restaurateur for over 20 years, including at Michael's on Simcoe and Autostrada . 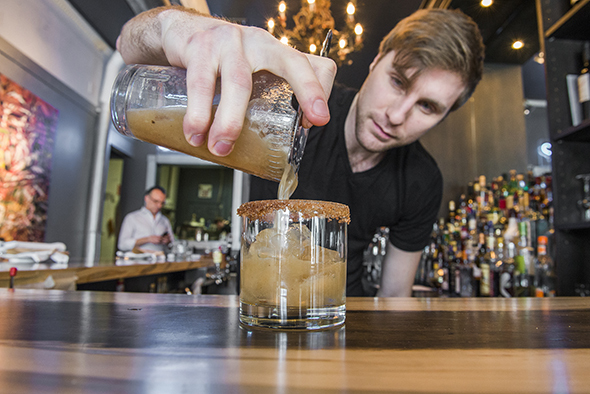 He lives in the neighbourhood and wanted to serve up something a little different here. 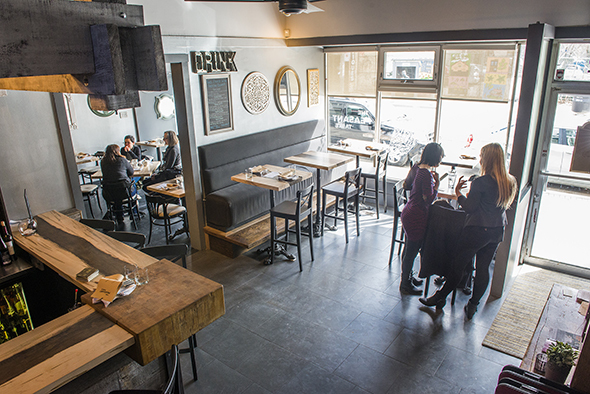 Alcohol-wise, the wine list mainly focuses on Italian with a few other origins thrown in for good measure ($8-$15/glass, $25-$149/bottle). Four of six beers on tap ($7/400ml) are Canadian craft brews (Mill Street, Beau's) while the other two are Bavarian (Paulaner). A variety of bottles and cans are also available ($6-$12). Cocktails contain minimal ingredients (no more than three), with classic Italian offerings and house signatures like the Peasant Bellini ($8, with Prosecco, Chambord and peach nectar), Italian Kiss ($10, with Luksusowa vodka, Amaretto and sour cherries) and Spicy Lady ($10, with Captain Morgan spiced rum, spiced pear puree, and a cinnamon sugar rim). 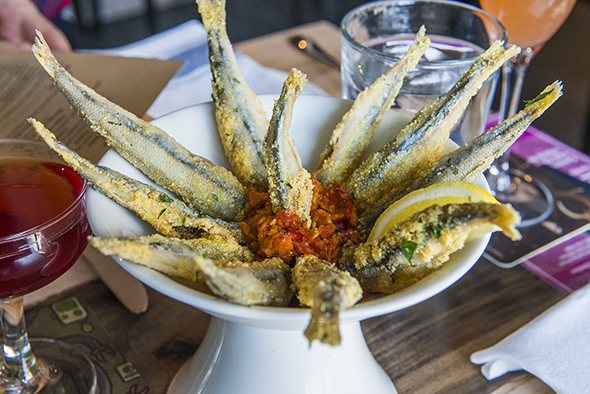 Bar snacks include addictive Sperlani ($8), which are crispy sea smelts accompanied by a wedge of lemon and a house-made spicy bomba that has a strong kick, getting spicier the more you eat it. Menus for brunch, lunch and dinner change with the seasons, and a special effort is made to have options for vegetarians and vegans - particularly important for this part of town. Since my friend and I are neither, we go for the meat. I try the Agnello ($17), one of The Peasant Table's brunch signatures. 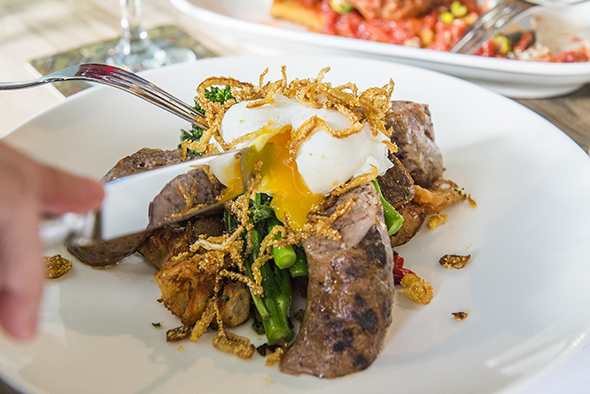 It consists of house-made lamb sausage, smashed potato and sauteed rapini topped with a poached free-range egg and crispy fried onion. The sausage has that distinct flavour of lamb, which goes well with all the other elements on the plate. It's definitely a hearty, satisfying dish. My friend's fave brunch item is the Salmone Affumicato ($16), a play on eggs Benedict. 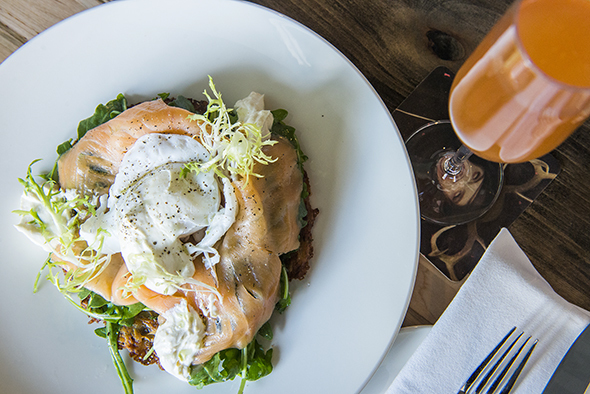 Instead of English muffin, a poached organic duck egg surrounded by smoked Atlantic salmon sits atop a crispy-on-the-outside, chewy-on-the-inside potato pancake with baby arugula. A refreshing, made-in-house mascarpone creme fraiche replaces the hollandaise. 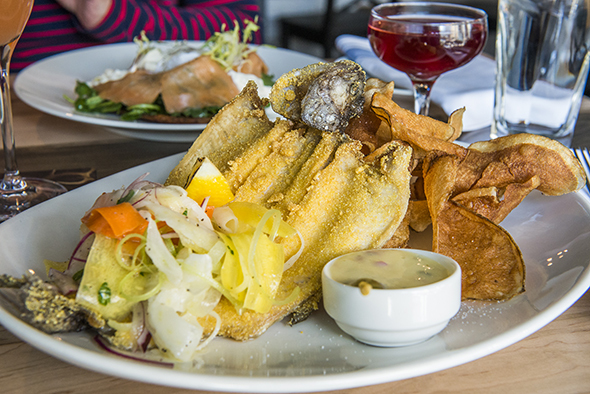 For lunch and dinner, there is an unconventional take on fish and chips ($19), which arrives as a whole butterflied and deboned rainbow trout (yes, served with head and all) that uses the same cornmeal-and-flour batter as the Sperlani to create a light and super crisp crust that's less oily than the usual fish and chip batter. Actual house-made potato chips take the place of fries, and duck egg tartare and a fennel and heirloom carrot slaw complete the main. 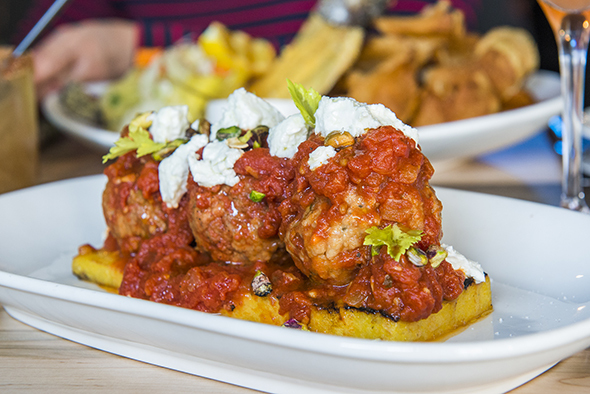 Cinghiale ($18), another house specialty, comes with three house-made wild boar meatballs on a dense bed of grilled polenta and topped with sugo, creamy goat cheese and pistachios. 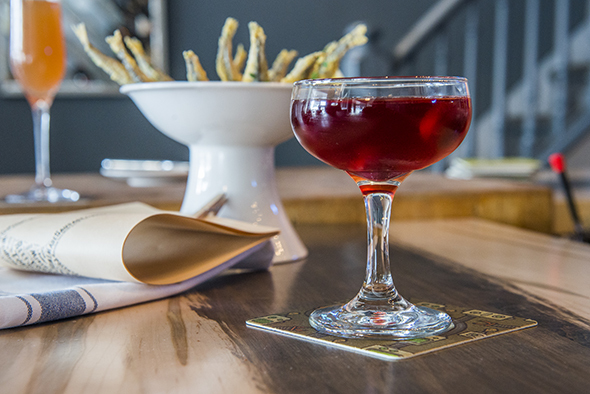 With weekly specials on drinks almost every day plus a daily happy hour and some tasty food, this makes for a staple brunch and dinner option in the neighbourhood.